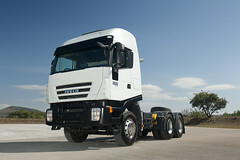 The new STRALIS range of Euro 3 and Euro VI engines have higher displacement and torque for the same fuel consumption. These new engines have also been fitted with a new electronically controlled variable geometry turbocharger (EVGT). • class-leading specific power and torque thanks to the higher thermodynamic efficiency of the power-plants, combined with common rail technology and the new electronically controlled variable-geometry turbocharger.